Before diving into how you can access the 3D dust map, we'd like to make you aware of a few important points about the dataset. 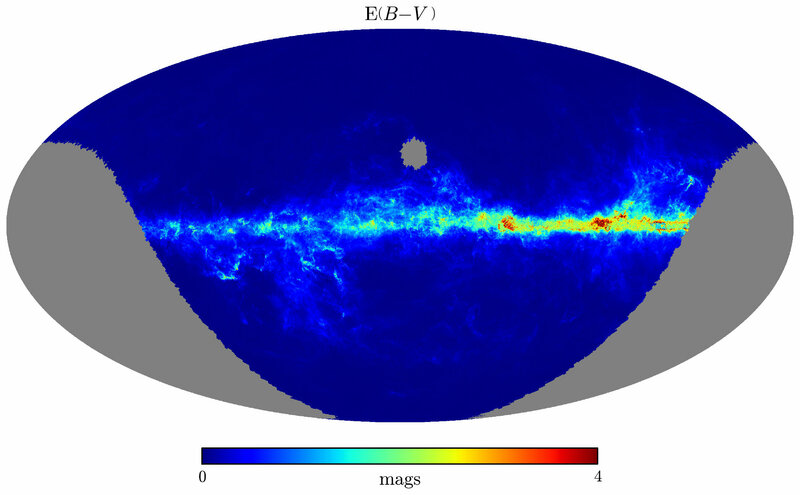 There are two versions of the 3D dust map, which we refer to as Bayestar17 (Green et al. 2018) and Bayestar15 (Green et al. 2015). Please refer to the papers for detailed differences between the maps. Bayestar17 supersedes Bayestar15. The units of Bayestar17 and Bayestar15 differ. This is primarily due to the different extinction laws assumed by the two versions of the dust map. While Bayestar17 assumes the extinction law derived by Schlafly et al. (2016), Bayestar15 relies on the extinction laws of Fitzpatrick (1999) and Cardelli et al. (1989). Both Bayestar17 and Bayestar15 are intended to provide reddening in a similar unit as SFD (Schlegel et al. 1998), which is not quite equal to E(B-V ) (see the recalibration of SFD undertaken in Schlafly & Finkbeiner 2011). Because the Fitzpatrick (1999) reddening law is different from the reddening law we assumed when producing Bayestar17, the two above relations give slightly different conversions between the values reported by Bayestar17 and E(B-V ). Using Eq. (1), we find that E(B-V ) = 0.884 × (Bayestar17). Using Eq. (2), we find that E(B-V ) = 0.996 × (Bayestar17). The overall normalization of Bayestar17 was chosen so that one unit of Bayestar17 reddening predicts the same E(g-r ) as one unit of the original SFD reddening map. That means that if one assumes Eq. (1) to hold, then Bayestar17 is equivalent to SFD, and reddening in non-PS1 passbands can be obtained by multiplying Bayestar17 by the coefficients in Table 6 of Schlafly & Finkbeiner (2011). In contrast, Bayestar15 reports uses the same units as Schlegel, Finkbeiner & Davis (1998) reddenings. Although this was originally supposed to be the excess B-V in the Landolt filter system, Schlafly & Finkbeiner (2011) found that it differs somewhat from the true stellar B-V excess. Therefore, in order to convert our values of E(B-V ) to extinction in various filter systems, consult Table 6 of Schlafly & Finkbeiner (2011) (use the values in the RV = 3.1 column), which are based on the Fitzpatrick (1999) reddening law. For 2MASS passbands, Bayestar15 assumes a Cardelli et al. (1989) reddening law. Note that the Bayestar15 extinction coefficients differ more from those used by Bayestar17 in the near-infrared than in the optical. This is due to the uncertainty in the gray component of the extinction vector (corresponding to an overall additive change to all extinction coefficients), which is not as well constrained as the ratios of reddenings in different filter combinations. For example, the ratio of E(g-r ) to E(J-K ) is better constrained than Ag, Ar, AJ or AKs individually. Because the near-infrared extinction coefficients are smaller than those at optical wavelengths, near-infrared extinction estimates are more affected (percentually) by uncertainty in the gray component than optical extinctions. The Bayestar17 extinction coefficients were derived under the assumption of zero reddening in the WISE W2 passband. This necessarily produces an underestimate of the gray component of the extinction vector. If one instead assumes that AH / AK = 1.55 (Indebetouw et al. 2005), then an additional 0.141 should be added to all of the Bayestar17 extinction coefficients. If one assumes that AH / AK = 1.74 (Nishiyama et al. 2006), then one should add in 0.063 to all of the Bayestar17 extinction coefficients. The gray component that should be added into the Bayestar17 extinction coefficients is therefore in the range 0 ≲ ΔR ≲ 0.141. For each sightline, we provide multiple estimates of the distance vs. reddening relationship. Alongside the maximum-probability density estimate (essentially, the best-fit) distance-reddening curve, we also provide samples of the distance-reddening curve, which are representative of the formal uncertainty in the relation. Most statistics you may wish to derive, like the median reddening to a given distance, are best determined by using the representative samples, rather than the best-fit relation. We include a number of pieces of information on the reliability of each pixel. A convergence flag marks whether our fit to the line-of-sight reddening curve converged. This is a formal indicator, meaning that we correctly sampled the spread of possible distance-reddening relations, given our model assumptions. It does not, however, indicate that our model assumptions were correct for that pixel. This convergence flag is based on the Gelman-Rubin diagnostic, a method of flagging Markov Chain Monte Carlo non-convergence. Additionally, minimum and maximum reliable distances are provided for each pixel, based on the distribution of stars along the sightline. Because we determine the presence of dust by observing differential reddening of foreground and background stars, we cannot trace dust beyond the farthest stars in a given pixel. Our estimates of dust reddening closer than the nearest observed stars in a pixel are similarly uncertain. We therefore urge caution in using our maps outside of the distance range indicated for each pixel. The Python package dustmaps provides functions both for querying Bayestar15/17 and for downloading the maps. The dustmaps package also makes a number of additional 3D and 2D dust maps available through a uniform framework. For users who do not wish to download the entire Bayestar15/17 maps, dustmaps provides functions for querying these maps remotely. The above code will contact our server to retrieve only the coordinates you're interested in. If you're interested in only a few - or even a few thousand - coordinates, this is the most efficient way to query the map. >>> bayestar = BayestarWebQuery() # Uses Bayestar2017 by default. See the dustmaps documentation for more information. If you prefer not to download the dustmaps Python package, or if you don't use Python, you can still remotely query the older version of our map, Bayestar15, with the following function, given in both Python and IDL. We strongly recommend the dustmaps package, but the following code is an alternative way to access the older Bayestar15 map. 'distmod':    The distance moduli that define the distance bins. 'success':    1 if the query succeeded, and 0 otherwise. 'n_stars':    # of stars used to fit the line-of-sight reddening. 'DM_reliable_min':  Minimum reliable distance modulus in pixel. 'DM_reliable_max':  Maximum reliable distance modulus in pixel. ;  'distmod':    The distance moduli that define the distance bins. ;                  reddening vector (use R_V = 3.1). ;                  the probability density on reddening profiles. ;  'success':    1 if the query succeeded, and 0 otherwise. ;  'n_stars':    # of stars used to fit the line-of-sight reddening. ;  'DM_reliable_min':  Minimum reliable distance modulus in pixel. ;  'DM_reliable_max':  Maximum reliable distance modulus in pixel. ;   - Must call either with ra=, dec= or l=, b=. ;   - Angles are in degrees and can be arrays. ;   - JSON support introduced in IDL 8.2 (Jan, 2013) is required. ;   - THIS CODE RETURNS SFD-EQUIVALENT E(B-V)! ;       See Schlafly & Finkbeiner 2011) for conversion factors. ;       E(B-V)_Landolt is approximately 0.86*E(B-V)_SFD. This code can be adapted for any programming language that can issue HTTP POST requests. The code can also be found on GitHub. If you are going to be querying large numbers of sightlines at once, we kindly request that you use this batch syntax, rather than calling query() in a loop. It will be faster, because you only have to contact the server once, and it will reduce the load on the Argonaut server. If you prefer to work with the entire 3D map directly, rather than using the Python package dustmaps, you can obtain the data cube in either HDF5 or FITS format from the Harvard Dataverse: Bayestar17 and Bayestar15. The full map comes to over 4.5 GB in compressed HDF5 format, so if you're only interested in individual sightlines, we strongly recommend you use the remote query API in the dustmaps package. The HDF5 format is a self-documenting, highly flexible format for scientific data. It has a number of powerful features, such as internal compression and compound datatypes (similar to numpy structured arrays), and has bindings in many different programming languages, including C, Python, Fortran and IDL. /pixel_info : pixel locations and metadata. /samples : samples of distance vs. reddening profile in each pixel. /best_fit : best-fit distance vs. reddening profile in each pixel. /GRDiagnostic : Gelman-Rubin convergence diagnostic in each pixel. All four datasets are ordered in the same way, so that the nth element of the /samples dataset corresponds to the same pixel as described by the nth entry in /pixel_info. As our 3D dust map contains pixels of different sizes, /pixel_info specifies each pixel by a HEALPix nside and nested pixel index. >>> # The Gelman-Rubin convergence diagnostic in the first pixel. >>> # Each distance bin has a separate value. >>> # Typically, GR > 1.1 indicates non-convergence. The variable pix_info specifies the location of each pixel (by nside and healpix_index), while EBV_far_median contains the median reddening in each pixel in the farthest distance bin. We want to construct a single-resolution HEALPix map, which we can use standard library routines to plot. All code snippets included on this page are covered by the MIT License. In other words, feel free to use the code provided here in your own work.